BigVEncoder comes to the desktop! 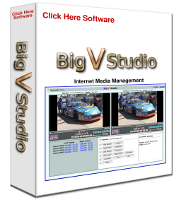 BigV Studio is a brand new product recently developed by Click Here Software. It has been in use for the past several months for internet broadcasting of many various types of events such as auto racing, hockey, baseball, church services, and others. The software has proven itself very well during this beta testing stage and is now being readied for the commercial market. The construction of this site has just begun and will continue to develop. BigV Studio will be ready very soon.